So at the last minute I am happy to say that my Mad Men inspired dress (as part of Julia Bobbin’s mad men challenge) is complete! I am not even going to attempt to do a Megan Draper impersonation, shes so fabulous and beautiful but I look nothing like her and besides the old fashioned telephone is at my parents house…my boyfriend and I don’t even have a landline! Kind of wish I had my ears pierced so I could rock some earrings with this dress! I lost track of all the alterations I made to this dress, because there were so many. The main problem was the neck and the stand collar. When I originally tried it on, it was so tight and restrictive that I could not see myself ever wearing it. 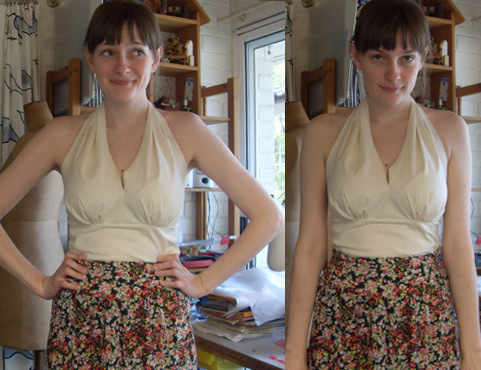 I think the burda pattern I used was an original repro pattern! Folks back then must have been used to things that were restrictive around the neck, but I just can’t handel anything that is too tight there (and my neck is not big)! I took the side seams of the dress in and because of this alteration I also had to take the sleeves in, which in turn probably made the neckline even tighter! Initially I thought I could just reduce the tightness in the neck by sewing out into the seam alloance a bit, but that did not do enough. I eventually ended up cutting off about 1 cm from the collar and the neckline and reattaching the collar. Golly there were a lot of tucks to contend with. This project got me very well acquainted with my unpicker! Another challenge was the unusual darts at the shoulders. Even though these sleeves are raglan sleeves, they had these curved shoulder darts, which probably enhanced the fit, but boy did I re-sew those shoulder darts many times, very tricky to get them right (everyone’s shoulders are unique especially mine). I really like the fit of the dress, it’s sort of semi fitted. The print placement is OK. I am pretty proud of the placement on the little stand collar…The sleeves are so cute! I love the slight belle effect. Going through my photos I noticed how many of them had me with hands on hips, but that’s just because it makes the sleeves look cool, I promise! I really like the curved bust darts! 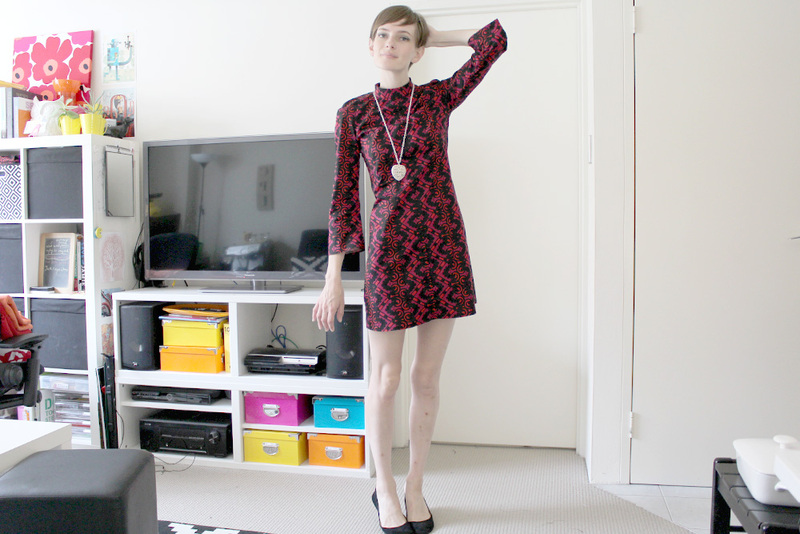 So many 60’s dresses have them and I was surprised that they give a good fit. I also really enjoy wearing this fabric, it’s a cotton of some description and it has a bit of stretch, seems to be the perfect dress weight! Sorry about the shoes! I wish I had cute 60s shoes, I have been on the lookout for some! Despite my lack of expertise on the topic, I feel like this really does have a late 60s feel, I don’t know if someone as glamours as Megan Draper would wear it, but for a silly gal like me it works. As soon as Sydney gets cooler I will wearing it with some tights perhaps black or an embellished fishnet pattern! 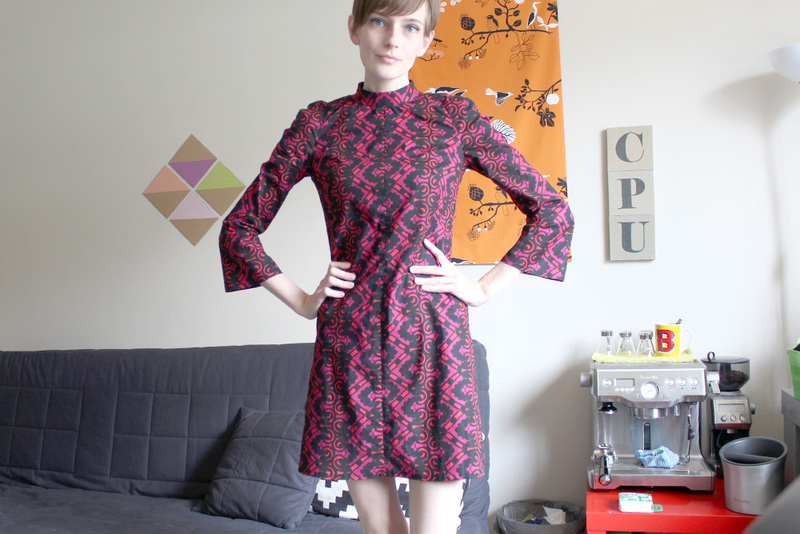 I can’t wait to see everyone Mad Men dresses and I am VERY excited about Mad Men’s return. I actually thought last season was one of the best, but if I told you more about my views on the show, I would risk revealing spoilers…. The fit of the back is good :). Ugh 😦 I hate short hair that is long at the back! this is before the back of my hair was trimmed…Looks better now. Who else is looking forward to the final season of Mad Men? I have decided I am going to participate in Julia Bobbin’s Man Men Dress Challenge. She is an amazing blogger who’s creations are always super cute/inspiring! I just love her Peggy Olsen Gingham Dress! 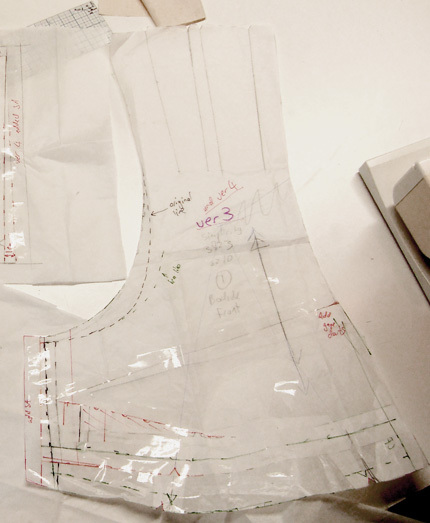 The deadline for creating a Mad Men-inspired dress is Friday, March 30. I have never participated in a challenge so whether or not I get it done by then is anyones guess. Last night I went trawling through Mad Men images. I remember after I watched the first season of Mad Men I took a bunch of screen caps. It is just filled with inspiring looks, but you dont need me to tell you that… Janie Bryant does such an amazing job. Ah the 60s has always been my favorite era in fashion as I love the femininity and glamour. I found so many dresses I wanted to try and make. I think Joan is the most stylish and her looks always compliment her gorgeous curves so well (eg the tailored sheath dresses and pencils skirts)! Unfortunately I don’t have any fabric in any of the colours that she wears :(. I got a little sad and disheartened because I thought I had lots of fabric… but I have NO FABRIC that resembles any of the looks that I love on the show! I have a lot of bright colours and bold patterns in my stash! I went fabric shopping today and I found a cotton in a hot pink that is sort of similar in colour to the dress worn by Betty Draper (or whatever her new last name is now) in the above photo. My fabric is a lightweight cotton with a very narrow pinstripe, while the dress Betty is wearing is a Silk Taffeta. I know Taffeta behaves very differently to a cotton but thats OK. I am more of a casual girl (I never have occasion to wear taffeta gowns!). 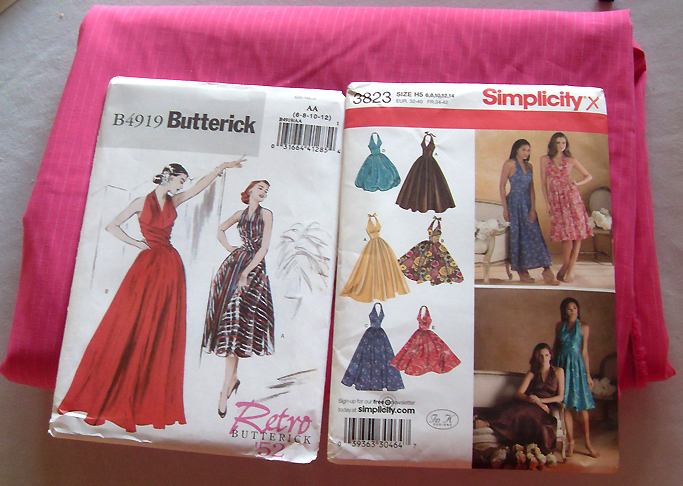 Simplicity 3823 most resembles the bodice of Bettys dress (there is a seam under the gathered bust) but I want to add some kind of wrap-over detail and the waist like butterick 4919. So I just may be making a Betty-inspired dress which she chose because she was inspired by Marylin Monroe.